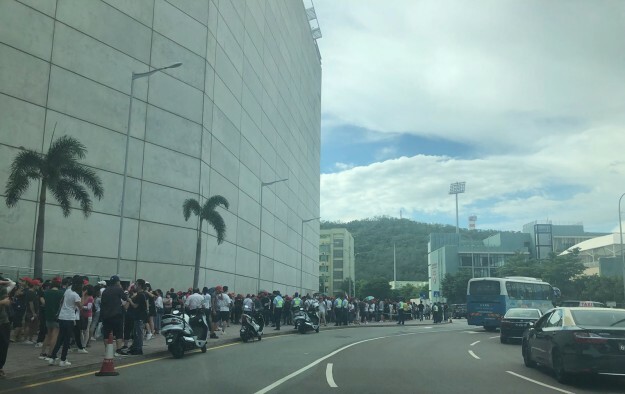 Nearly 2,200 people participated in a Wednesday gaming labour protest march in Macau targeting casino operator Melco Resorts and Entertainment Ltd, according to organiser local activist group Professional for Gaming of New Macau. The police estimated about 1,300 took part in the protest. Marchers at the rally were demanding from Melco Resorts better remuneration terms and a “summer bonus” for the company’s staff. The march passed outside City of Dreams Macau, the firm’s flagship property in Cotai. It was not clear if all of the protesters were Melco Resorts’ employees. In a Monday press briefing, Cloee Chao, director of the labour group, told reporters that the protest march was aimed to voice workers’ concerns on Melco Resorts’ in-house retirement benefits fund, and its enforcement of smoking control policy inside its casinos. In an emailed statement to GGRAsia on Wednesday, a spokesperson for Melco Resorts said the company had “processes and mechanisms in place” to listen to its employees. “We take great pride in offering a great working environment for our employees, and will listen to their issues directly; we also take internal and external factors into consideration when making decisions on these matters,” the person stated. “One example of Melco’s dedication … is the Golden Nest Egg programme,” said the spokesperson. That was a reference to a company programme that allowed its eligible employees to get a one-off payment equivalent to six times of the relevant employee’s monthly salary. “This was in addition to any discretionary annual bonus paid by Melco, and it was at the time and remains to this day the highest such payment in the industry,” the person added. Ms Chao had told GGRAsia last month that the labour group had received complaints from some of Melco Resorts’ casino dealers about the firm’s provident fund policy. Those employees claimed that the firm only contributed to its in-house provident fund based on the employees’ base salary, a practice that Ms Chao said had been “discontinued by the other gaming operators in 2014 or 2015″.